Waterlilies or Nymphaeaceae are flowering plants that live as rhizomatous aquatic herbs. This means that waterlilies are rooted in soil under a body of water, while the leaves and flowers float in the water surface. If you have a small pond in your garden, waterlilies are good additions to your collection of ornamental plants. These aquatic plants can give your garden a totally different look and tranquil vibe. If you don’t where to start, here’s a quick guide on how to plant waterlilies. Do water lilies need soil to grow? Waterlilies need to be rooted in the soil to grow. It is important to use the proper soil as it can cause several problems. For waterlilies, a heavy clay loam is the most ideal soil. This soil is used specifically for aquatic plants. It holds water and nutrients without floating in the surface. It also creates a firm anchor for the roots of any aquatic plants. There are several varieties of waterlilies. But they are categorized into 2 types. Tropical lilies – these lilies only bloom during the evening. It also produces blue petals. And much more ideal for places with warmer temperature. Tropical lilies can’t also tolerate temperature below 65 degrees Fahrenheit. Hardy lilies – these lilies only bloom flowers during the day. They can tolerate colder climate than tropical lilies. How long do water lily flowers last? The water lilies flowers only last up to 4 days until it submerges and rots underneath the water. But a healthy lily can produce up to 6 flowers a day. Containers that are shallow but wide. Ideally 6 x 10 inches deep and 12 x 18 inches wide. waterlilies tubers that you can buy from your local nursery. How to plant water lilies? Plant the waterlilies in the spring – from late April to May. Make sure to plant lilies when the weather is a bit warmer. Even if hardy lilies can tolerate colder temperature, it is important to still avoid planting them when there’s a risk of frost. 1. Prepare your containers. Make sure the containers meet the ideal depth and width. Select a container that doesn’t have a drainage hole but if the containers have drainage holes, use a burlap to cover it to keep the soil in the container. 2. Fill the containers with a heavy clay loom soil. Do not use floppy plotting soil, it won’t be able to hold water and will float out of the container. Only use soil that is specifically for aquatic plants. Add fertilizers to prepare the soil for planting. The amount of fertilizers needed depends on the specific product you are using. Read the instructions properly. 3. Plant the waterlilies tubers in the container. Make sure to place them on the side of the container with the tip pointing upward at 45 degrees angle and to the center of the container. Add more soil and cover the top with small rocks or pea gravel to keep the soil from floating. Make sure to rinse the pea gravel before adding to make sure it’s free from any pest or insects. Don’t add too much gravel around the base of the plants to avoid stressing the new plants and to give enough space for them to grow. 4. Water the plants well and then place the container in a pond or aquatic planter. Make sure the leaves or crown is not submerge in the water and floating instead. If the pond is too deep, put planting ledges or stack bricks under the container to ensure the leaves will float. This will ensure the growth of the lilies. 1. Lower the container gradually as the lilies grow as well. Make sure the crowns are always partially covered by water. 2. Remove dead leaves and old flowers before they rot. Flowers only last up to 4 days and they should be trimmed when they wither. Leaving dead leaves and old flowers might infect the entire plant and will help keep the water clean in the pond. This will also encourage growth for new flowers. 3. Add slow-release fertilizers every month. To add fertilizers, simply lift the container out of the water and use your hands to insert fertilizer pellets or tablets to the soil. Smooth out the gravel and put back the container into the pond or to your aquatic planter. 4. As the lilies grow, the rhizomes or the root ball, crowd the container. Divide them every couple of years and plant the new tubers in separate containers. If you have a big pond, this will give you more water lilies to admire. Periwinkle is a perennial herb that blooms flowers all year round. Its flowers normally vary in colors ranging from yellow-green to lavender. This plant is normally used as an herbal or ornamental plant. As an ornamental plant, periwinkle is used as a flower bed. If you are looking for bedding plants, growing periwinkle as a ground cover is a good choice. They only grow at 4 inches at the most and can expand up to 8 feet across. Which is ideal for ground cover plants. There are two species of periwinkle or vinca: the vinca major, which grows in the wild mostly and has bigger plants and flowers, and the vinca minor which is commonly used as ground cover. The latter is also known as common periwinkle, dwarf periwinkle, myrtle, and creeping periwinkle. Vinca minor is a trailing subshrub that spreads in the ground and it occasionally scrambles but doesn’t twine or climb. Which makes it a good bedding plant. Where can you grow periwinkle? Periwinkle plants are easy to grow and care for. It is a low maintenance plant that requires well-drained but moist soil, plenty of sunlight and warm temperature. This plant is highly tolerant to heat so planting them anywhere that gets over 65 degrees Fahrenheit will ensure a healthy flower bed. What type of soil works for periwinkle? Common periwinkle thrives best in a well-drained and acidic soil. Especially, if you need vigorous growth for a large area to cover. However, it can thrive in many types of soil and conditions. How to plant periwinkle as ground cover? Planting periwinkle from seeds is an easy process as long as you know what you’re doing. However, it grows slowly so patience is key. 1. Prepare the flat by filling it with 2.36 inches of seed starting mix. A flat is a nursery plant tray which is made of plastic usually. It is made to facilitate watering and transporting plants. When choosing flats, make sure to get the flat with individual cells for easier transporting. 2. Put 3 to 4 seeds in each cell and cover it with 1/4 inch of seed starting mix. Press down the soil lightly and moist the mix by spraying water into using a spray bottle. Avoid overwatering it. Cover the flat with black plastic to block any light but maintain a temperature of 77 degrees Fahrenheit. 3. Once the seeds germinate, remove the black plastic cover. This should take place between 1-2 weeks. Place the flat to a location where the seedlings can get full sunlight and a temperature above 70 degrees Fahrenheit. 4. Water the sprouts lightly. Keep the soil moist but avoid overwatering it. After 10 days from germination, add 10-4-3 fertilizers. Cut off unhealthy leaves or plants in each cell and leave at least the healthiest plant. 5. Once the plants are at least 3 inches tall, prepare the transfer to the ground. Dig a hole in the ground enough for the periwinkle roots to fit. Keep at least 8 inches of space between the plants. This will periwinkle enough space to grow. 6. Loosen the soil in the ground before transferring the seedlings. Add mulch and compost into a 2-inch layer over the soil surface and till it. 7. Remove your seedlings carefully from the flat. Hold the leaves and avoid holding them by their stems or roots to avoid damage. Avoid breaking any roots as much as possible. And plant them on the ground as soon as possible. Water the plants immediately and keep the soil moist but not soaking wet. The periwinkle is a low maintenance plant as long as it gets partial sunlight. However, adding extra care help any plants reach their maximum growth. 1. Water the plants daily. Always keep the soil moist but soggy. You can skip watering during the rainy season. 2. Prune your periwinkle plants when necessary. Periwinkles are naturally invasive so use pruning shears to cut any dead leaves or damaged parts of the plants. 3. Apply pesticide when necessary. Periwinkles are highly resistant to most pests and diseases but rust can be a problem for places with high humidity. As an alternative, always remove any leaves that have brown or black patches right away. A beautiful small flower that comes in numerous shades, marigold is a herbaceous plant belonging to the family of sunflowers. It has become a popular choice among a lot of people for a simple reason that it does not demand too much. Neither does it care much about soil conditions, nor about the season. Calendula and Tagetes are the two genera of marigold which include about 50 different species of the flower. The genus Calendula is native to the Mediterranean, Western Europe, Micronesia, and southwestern Asia. This genus is of about 15-20 species. On the other hand, the genus Tagetes is native to North and South America. Despite its native background, some of its species have become popular across the globe. Some of these species have been used traditionally in some parts of the world. In the ancient times, Romans and Greeks used to wear garlands or crowns made of golden calendula. People in India have been using marigold flowers to decorate the statues of Hindu deities for quite a lot of time. There’s a lot about these beautiful flowers that can one grasp. We’ll discuss different varieties of marigold flowers that are found enhancing the beauty of yards, and sidewalks. Discovered in Mexico, this single, bright-red flower blooms all through the summer season. The petals of this beautiful flower are spade-shaped and have squared-off tips. It is believed to be a hybrid one. Butterflies and bees love to visit the blooms of cottage red. They grow best when exposed to the full sun, and any average well-drained soil. It is best suited for cutting gardens and mixed plantings. A bushy variety, it produces bright yellow double flowers that are generally considered to decorate mixed borders and containers. The fragrant daisy lemon yellow flowers have brown eyes at the end of the stems. In the past times, people used it as a replacement of saffron to give a rich color to the butter and cheese. It has also been used to treat smallpox and measles. Also, on the battlefields, soldiers would use it as a dressing for the wounds. Best known for its bright orange and yellow golf-ball shaped flowers that bloom to about three inches. Since they don’t get sad because of the extreme hot weathers, a lot of people choose to plant them in their garden bed or containers and borders. An added advantage of Antigua orange species is that it goes well with almost every edible or blooming garden plant. 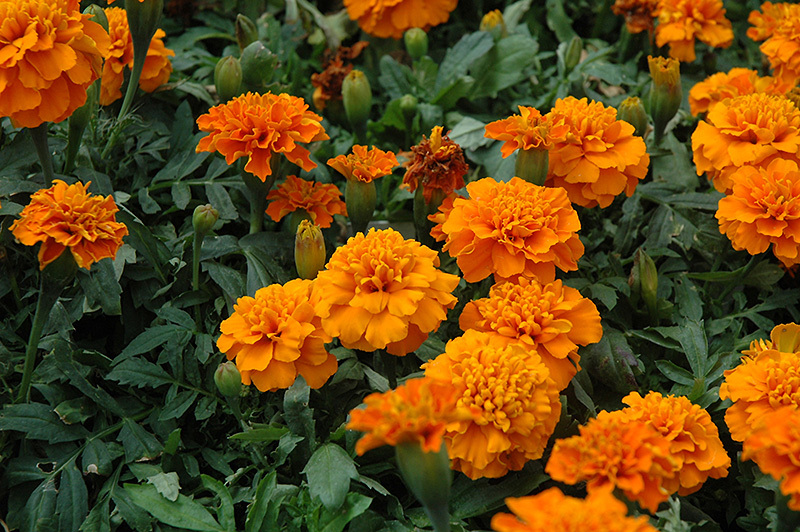 Tomatoes, beans, carrots, and cabbages are some of the plants that benefit from marigold as their companion plant. Also known as American marigold and African marigold, Doubloon produces large, fully double golden yellow flowers that rest on sturdy stems. The dark green ferny foliage has an aromatic smell which is quite distinctive. Whether the climate is warm or there’s heavy downpour, the doubloon marigold stands upright throughout the period. The plants of nematode-susceptible vegetables make good companions of the doubloon marigold because the roots of the latter emit a substance that deters root nematodes. Belonging to the genus Tagetes and the species, erecta, these fully double flowers that grow in the form of 4 inch balls attract both the butterflies and the humans. Whopper is a new standard for large marigold flowers. Unlike some of the other varieties, whopper yellow doesn’t get to rest on their laurels after a couple of blooms. They keep blooming all season long. If you plant them close, they would look like a solid wall of flowers which hides under them the foliage and ground. Scientifically known as Tagetes patula, Janie Deep Orange is the most floriferous French marigold out there. The curls on this marigold resemble that of the carnation ones, which make both of these flowers look identical. 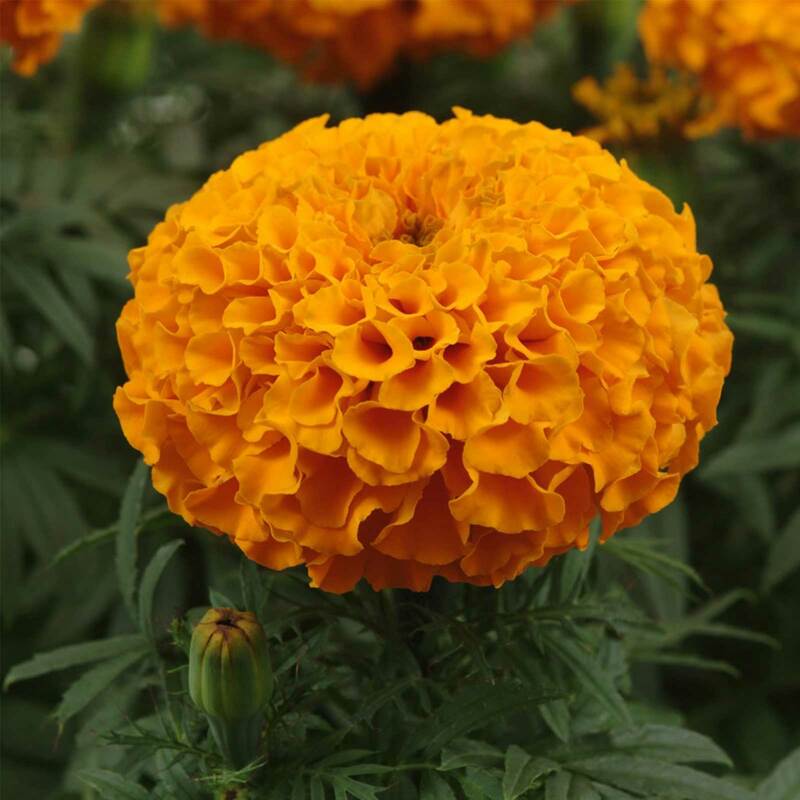 This variety of marigold is known to tolerate extremely hot climatic conditions, and they grow well when the soil is kept warm throughout the process. It is ideal for container planting, border edging, and mass planting. One great thing about this flower is that deer don’t care about its presence in the garden and leave it alone to let it grow. Since it belongs to the genus Tagetes, it is also called French marigold. Safari Red produces compact and large-flowered blooms with quite a lot of deep orange-red, gold-tipped petals. 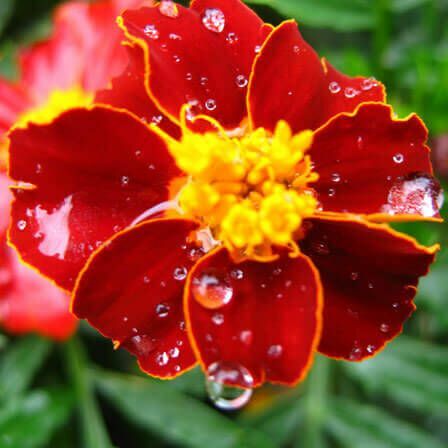 Any pH of the soil is ideal for safari red marigold flowers to nourish. It has got fern green fragrant foliage which and does not have any thorns. Butterflies love the colors of this flower and they are attracted towards it. It generally blooms for an entire season before you need to replace it in the next season. 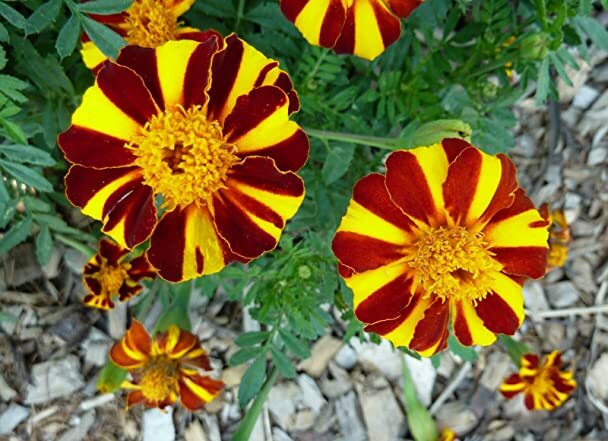 It is the most unique marigold with double blooms that have alternating colors on the petals. 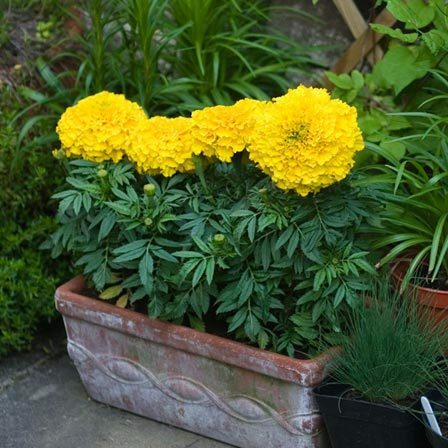 There’s nothing challenging about planting and growing this variety of marigold which makes it popular for crafting purposes. This beautiful and attractive flower attains a height of about 16 inches to the maximum. If you deadhead it regularly and properly, the flower will bloom all summer long. Frost has the ability to halt its growth and bloom. This mound shaped biennial has daisy-like bright yellow flowers. It is a North American species of the marigold which is native to the Mexican deserts and the southwestern United States of America. 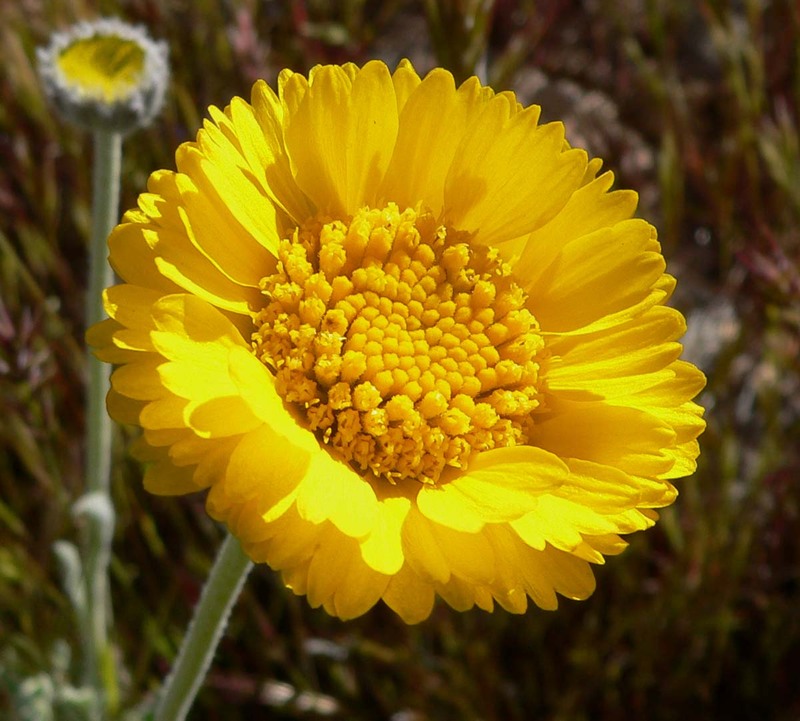 Desert Marigold, also called Baileya multiradiata, is mostly found in the states of Durango, California, Nevada, Texas, and Arizona. The foliage of this short-lived perennial is grey in color and has the texture of wool. Pot marigold is the other name of Bon Bon Orange marigold. It has got double orange flowers on the stems that grow relatively fast and deliver bright sunny shade all through the season. Originally originated in the Mediterranean and Europe, it grows better in well-drained soil and enough sun exposure. Just like regular lighting and watering, you have to deadhead it regularly to encourage continuous flowering. The flowers of this marigold attract bees and butterflies. Its petals can also be used as edibles to add flavor to the food and salads.